Parks Canada is dedicated to preserving some of the best corners of the country in National Parks. Canada is the world's second largest country, encompassing a lot of land within its borders. From the world's highest tides in the Bay of Fundy to the wide-open spaces of the prairies, Canada's 43 national parks each offer visitors a unique taste of Canada. From coast to coast, Canada stretches nearly 6,000 miles. Kluane National Park is the most westerly park, home to Canada's highest peak. Mount Logan towers 19,550 feet in the air above snow-capped mountains and glacial ice fields of the Yukon Territory. Along the Pacific coast, the ocean pounds the coast of Pacific Rim National Park. Sandy beaches and rocky shoreline give way to rainforest thanks to the warm climate. Take a boat to explore the Broken Group Islands Archipelago offshore, or head inland to Kootenay National Park for something a little different. These were sacred grounds for First Nations people, where they would gather the red earth so stained by minerals in the rock. Any visitor looking for high mountains and heavy snow should stick to the parks in the west. In Alberta downhill skiing and ice climbing are popular winter activities, especially in Banff National Park where Lake Louise offers world-class skiing. 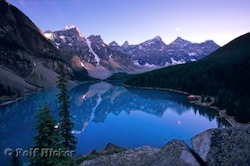 Banff is the original national park of Canada, adjacent to Jasper National Park and connected via the Icefields Parkway, 140 miles of spectacular scenery: cool blue glacial lakes and their parent glaciers, grizzly bears and bighorn sheep. There are a lot of mountain parks to choose from, but for a bit more sky try Grasslands National Park of Saskatchewan. The horizon is a long ways away on the prairies. One of the most endangered habitats in Canada, this park concentrates on the preservation of plant and wildlife. While the winters freeze to well below zero, fall is a time for delicate colors and comfortable temperatures. Heading east, Manitoba sees the land rise again in an escarpment of rolling hills. Riding Mountain National Park greets the new relief as a haven for more endangered species. Cougars and wolves make their home here, as do a captive herd of bison. Bruce Peninsula National Park overlooks Georgian Bay of Lake Superior, where cedar trees still grow, thousands of years old. Nearby Fathom Five National Marine Park has ecological and social history in the form of clean water and 22 shipwrecks, while butterflies migrate each year to Point Pelee National Park, the southernmost tip of mainland Canada. Birdwatchers migrate too to this small national park, following more than 300 species of songbirds that make a stop in the park during their annual migration North. Parks of the northern territories are a trove of treasures yet to be discovered. In the young park of Ukkusiksalik, Nunavut, 500 identified archaeological sites have yet to be fully explored. The park protects an expanse of arctic Tundra, and is named for the soapstone found here. Quttinirpaaq National Park is Canada's northernmost park, only accessible by chartered flight. This far North, the park sees 24-hour daylight in summer and all-day darkness in winter. There are no services in the park, so visitors will have to come fully prepared to be self-sufficient during their stay. Tuktut Nogait National Park in the North West Territories is the place to go for arctic wildlife. The name translates to 'young caribou', and it is birthing grounds for the 85,000-strong Bluenose caribou herd. Other animals include grizzly bears and wolverines. Peregrine falcons, tundra swans and arctic loons all make their home in this northern park as well. La Mauricie National Park is an outdoor playground in the Laurentian hills on the North shore of the St. Lawrence River. Summer days will be well spent biking or hiking, with a swim to cool off at the end of the day. The park welcomes cross country skiers in the winter, as does Forillon National Park on the other side of the river. This park is half the size of La Mauricie, situated at the tip of the Gaspe Peninsula. Autumn hiking trails here will lead you through the eastern reaches of the Appalachian mountain range. In New Brunswick, you reach the Atlantic Coast at last. There is no better place to explore than Fundy National Park on the shores of the Bay of Fundy. This is where the world-renowned 30-foot tides wash the tidal flats twice a day. Hiking and mountain biking will see you well acquainted with the Acadian forest that blankets the hills of Fundy National Park. Prince Edward Island National Park on Canada's smallest island province is home to perhaps the most well-known fictional character to come out of Canada. Lucy Maude Montgomery's Anne of Green Gables made her home in Cavendish, and the estate still stands within the park boundaries today. The sand dunes harbor red foxes and fragile marram grass. This is a park best visited in summer when island weather is most favorable. After such a trip across the country, Nova Scotia has a lot to live up to. It meets the challenge with two scenic parks. Kejimkujik is an inland paradise for paddlers. 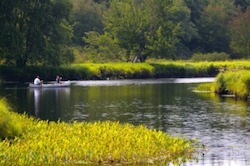 It's many waterways ideal for canoe or kayaks on multi-day adventures. The park has a seaside adjunct as well for more encounters with the Atlantic Ocean. In Cape Breton, the golden yellows and rich reds of Cape Breton Highlands National Park alight the deciduous forest above sheer ocean cliffs. In winter, cross-country skiers will find paradise in the guise of groomed trails. 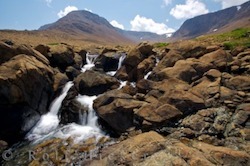 Across the Gulf of St. Lawrence, Newfoundland and Labrador boasts Gros Morne National Park. Carved by glaciers some 10,000 years ago, the fjords and mountains of the coastal park are a delight for hikers and paddlers alike. Local residents here still fish for lobster and capelin along the coast. Half a dozen more parks reside in Canada's Arctic, divided among three territories, each with their own natural and cultural history worth discovering. 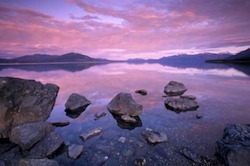 Each national Park of Canada is a snapshot of the country as diverse as it is wide.